When my dad went to the grocery store the other day, chicken thighs were on sale, so he picked up a package. Chicken thighs are already cheaper than the breasts, so when they go on sale they’re an even bigger money-saver. The thighs, however, are often given a bad wrap for being higher in fat than the breast, which of course, is true. In all honesty I prefer the breast because of that reason- I’m not a huge fan of all the extra blubber hanging off the thighs- gross. The meat itself is also a bit darker, and I prefer light meat, so the breast is usually my cut of choice. That being said, there definitely is a place for chicken thighs, even in a healthy diet. It just takes a little more creativity. What are those, you ask? 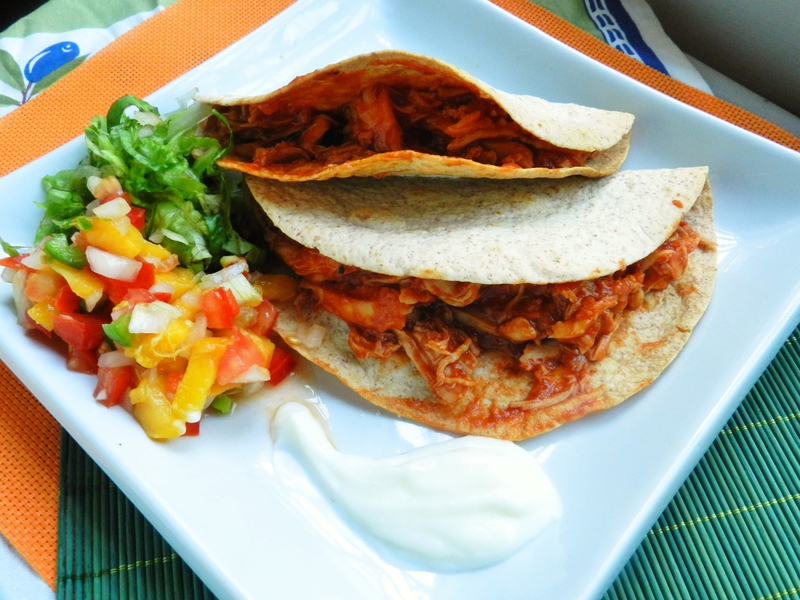 Why, pulled chicken tacos, of course! As we have mentioned before, both Julie and I are not overly fond of pork. Our brothers, though, really love pulled-pork, so this is our compromise. And here, my friends, is where chicken thighs have found their niche! You see, in this recipe, the chicken itself doesn’t have to look pretty, because you’re going to be shredding it up anyways, so you can rip it apart and mangle it up as much as you want to cut out a majority of that nasty excess fat that has found its way into all of the nooks and crannies of the thigh. At the end, if your chicken looks like it got in a fight with a lawn-mower, it doesn’t matter! The process of cutting out the fat is a little long and tedious, but it is very worth it in the end. Now, some of you may be thinking that by cutting out all of the fat we will lose all of the moisture. Ordinarily you would be correct, but in this dish, it is the sauce that is the real show-stopper, and completely makes up for any moisture loss. Before I go any further with the tacos, though, there is one other component of this meal that deserves some attention. Because what is a good taco without a little salsa? 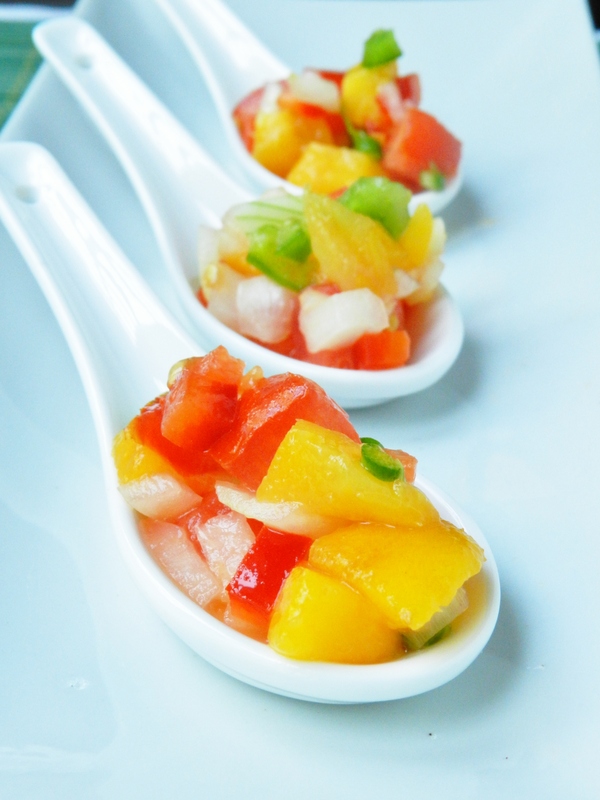 We served our tacos with peach salsa and honestly, this may have been my favourite part of the meal! Julie and I both were eating this stuff with just a spoon, it was that good. The peaches were perfectly ripe, and the sweet juiciness of them complimented the tacos pefectly. There isn’t really a whole lot I can say to describe how delicious it really was, so you’ll just have to make it yourself! 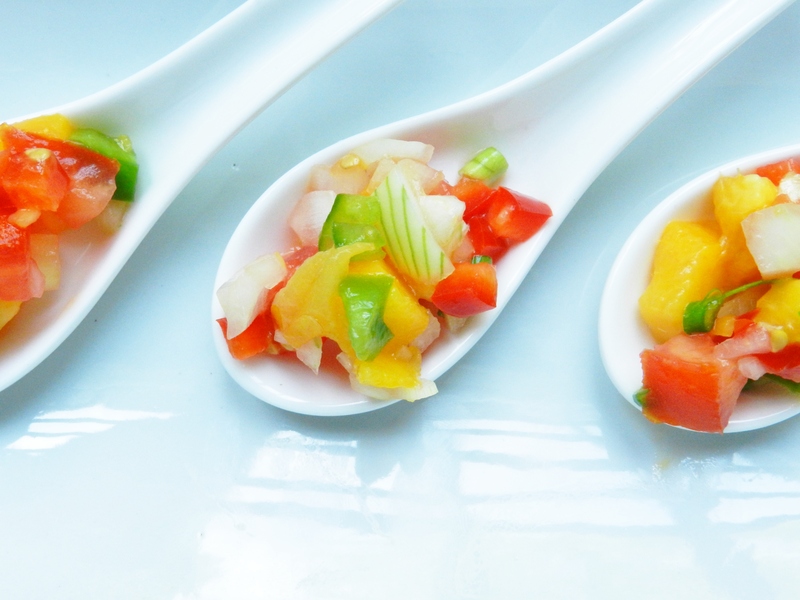 Combine all ingredients in a bowl and chill in the fridge for at least 30 minutes prior to serving. And now on to the main event! 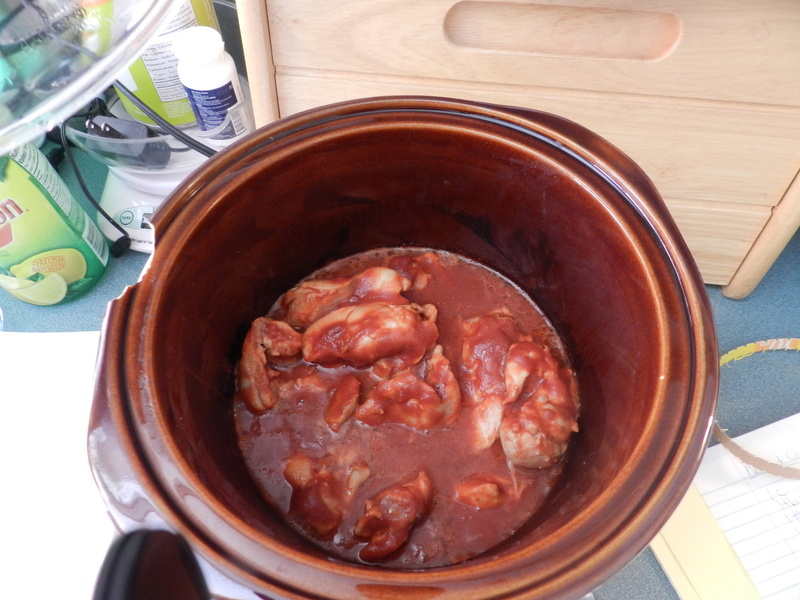 The first step is making your sauce and pouring it into a slow cooker with the chicken. Slow cooker meals are great in the summer time, because when you look outside and the sun is shining, the sky is a perfect blue with hardly a cloud and the thermometer is telling you that its the perfect weather for swimming, the last thing you want to be doing is spending hours in the kitchen. The Slow cooker is the perfect solution. It does all the work for you while you can enjoy the beautiful weather outside. Julie and I call our slow cooker Ol’ Faithful. She’s got a few chips and cracks, a few scratches, and is probably older than we are, but she has never failed us. Never burns our food, never under-cooks anything. Whatever we put in there always comes out moist and flavourful. The day this one kicks the bucket will be a day of mourning for us, i’m afraid. 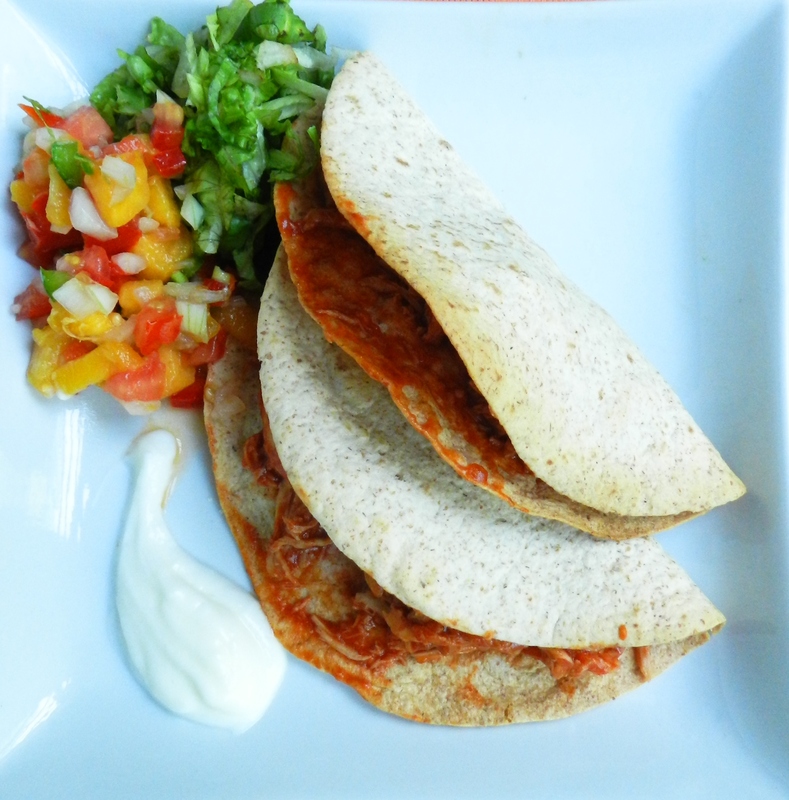 Insert a toothpick into each tortilla to hold them open, then bake them at 350 for 10 minutes. 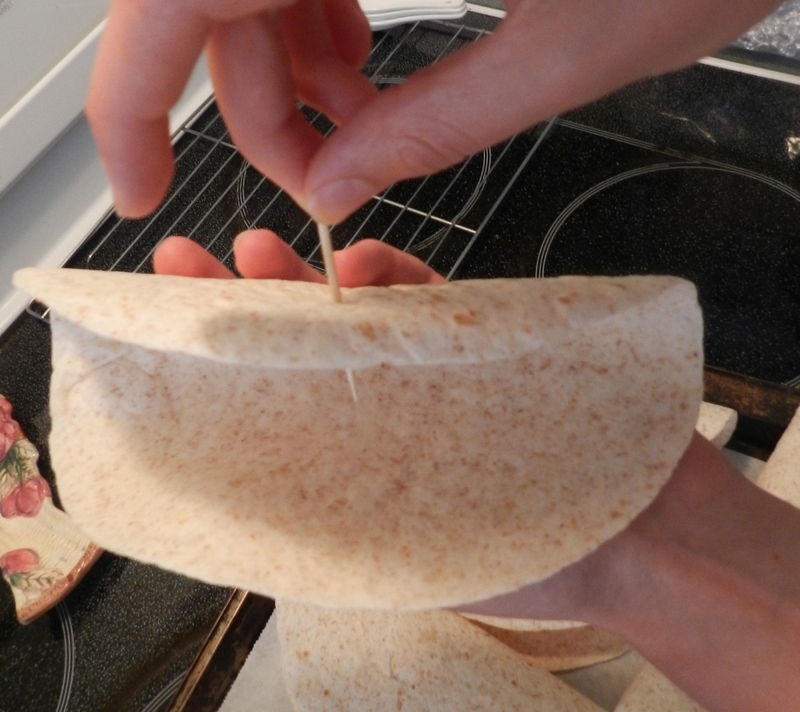 What we forgot to do: roll up a ball of tin foil and place it inside each tortilla to keep them from collapsing inward when baked. They still turn out crispy and delicious, you just have to pry them open a bit to get any filling inside. The tin foil on the inside will help you to avoid any cracked shells. The pulled chicken is really delicious, and you don’t just have to do tacos. We’ve made it before and put in on a bun, on salad, in wraps- it’s very versatile! This is one of our family’s favourite meals, so we hope you enjoy! Open up the chicken thighs and remove the excess fat. Place in the slow-cooker. 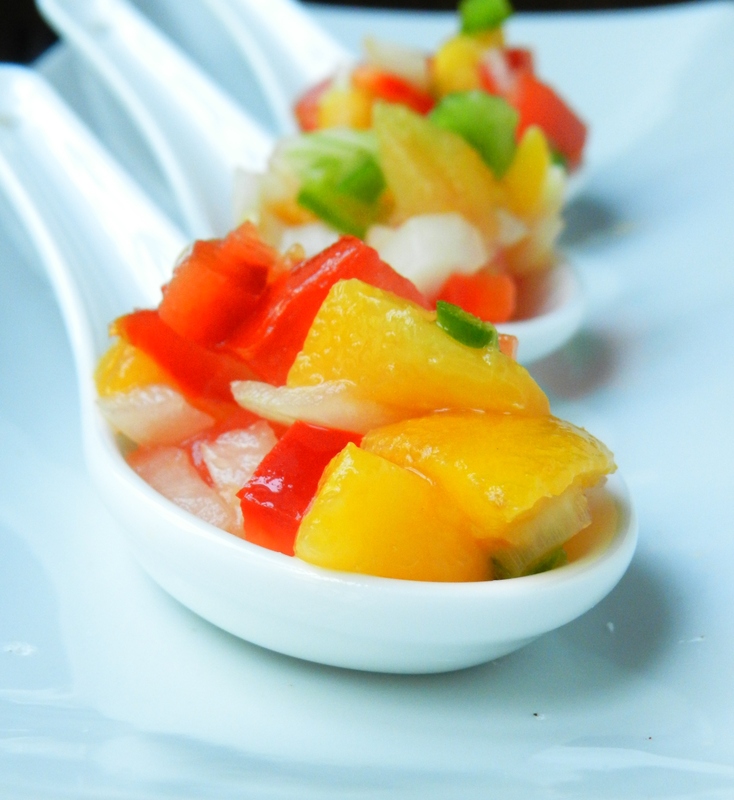 Combine all other ingredients except for corn starch in a separate bowl, stirring until smooth. Add the sauce to the slow cooker and stir. Cover and cook on low for 6-8 hours. Remove the chicken from the slow cooker shred it using 2 forks. Meanwhile, pour the sauce into a sauce pan and add the corn starch, whisking quickly to avoid clumps. Bring to a boil, then turn to low and simmer for 5-10 minutes or until slightly thickened. Add shredded chicken to the sauce and stir until evenly coated. Serve over buns, in tacos, over salad, etc. Do you like pulled pork? What is your favourite slow-cooker recipe? 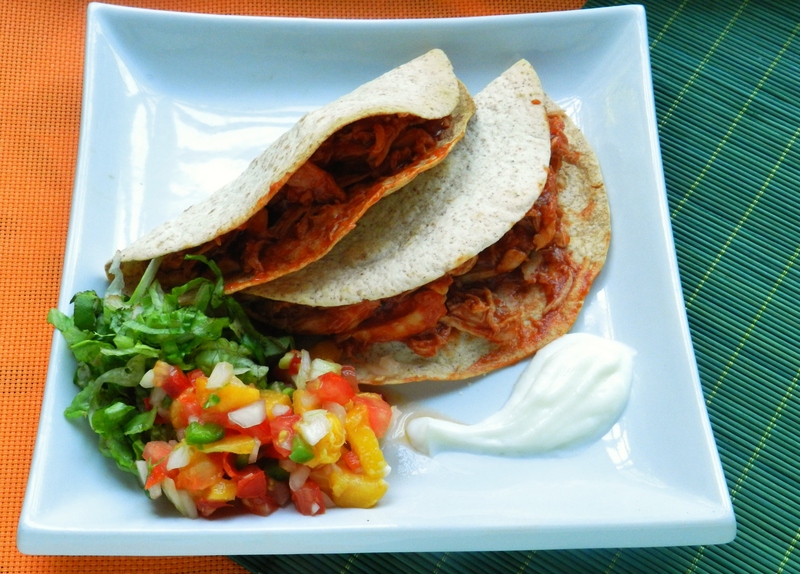 Posted in Uncategorized and tagged barbecue, chicken, easy, healthy, peach, salsa, slow cooker, taco. Bookmark the permalink.